This restaurant is famous for their skewer-grilled quail which tastes absolutely brilliant. Fushimi Inari Shrine is close to this restaurant that offers soba, udon, and rice bowls beside their grilled birds. All the dishes of this restaurant use bonito and kelp stock, but if you are a vegetarian they also have pickled cucumber sushi for you. The restaurant is located in a traditional Japanese house, so not only the dishes, but also the atmosphere of the restaurant is great. This restaurant close to Fushimi Inari Shrine is a great place to try the delicacy that is grilled quail. When in Fushimi, you have to do like the locals do, and have some grilled, skewered quail. The sweet soy sauce on the quail is extremely good. The bird may look a bit grotesque, with the bones and all, but once you bite to it the crunchiness will take you away. This thick tempura soba will make you cry with delight. The taste in Kyoto is a bit lighter than in Tokyo, but the subtle taste of the dashi stock is bound to make you smile. I recommend putting some shichimi chili mix on your soba to make it even more flavorful. Oyako means parent-and-child in Japanese, and in this bowl you have chicken and egg both, and by now you should know why it is called “oyakodon.” The leak gives a nice accent to the rice bowl and the sweet soy based sauce has a gentle but delicious taste, plus you get this rice bowl with a bowl of miso soup and Japanese pickles. These pieces of fried tofu filled with sushi rice are a pleasant but refreshing treat. It said that the foxes who are the messengers of Inari like this type of sushi, which is why this sushi is called Inari-zushi. A lunch box contains seven pieces so you can share them with your friends. They have an English menu. 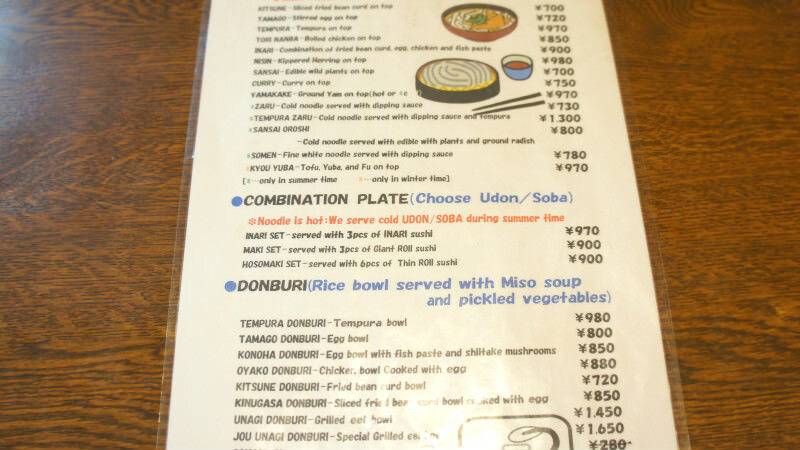 Some menu items like tempura soba and Inari-zushi can be had as a meal set too. If you want shichimi chili mix, just ask the waiter: “Shichimi wo kudasai” which means I want some shichimi. This restaurant has its specialty, and it is quite a specialty: skewered, grilled bird! You can choose from two birds: swallor and quail, but whichever you choose, you are going to get a bird on a skewer. While the bird does look rather grotesque the taste is surprisingly good, so for those of our readers who are feeling a bit adventureous around Fushimi Inari, Inafuku is the restaurant to go to. A 5-minute walk from JR Nara line Fushimi Station. On Tuesdays, and sometimes on irregular holidays. Do not bring any food or drinks into the restaurant. Skewer-grilled sparrow is awailable from the middle of December until February. English menu is available, and some menu items have pictures with them.